Kayaks await the annual Tour de Coal near the Upper Falls on the Coal River. Photo courtesy Coal River Group. Expecting to break attendance records again, organizers of one of the most popular river floats in the U.S.—the annual Tour de Coal—are opening registration early for paddlers who wish to participate in the June 15 event on the lower Coal River. 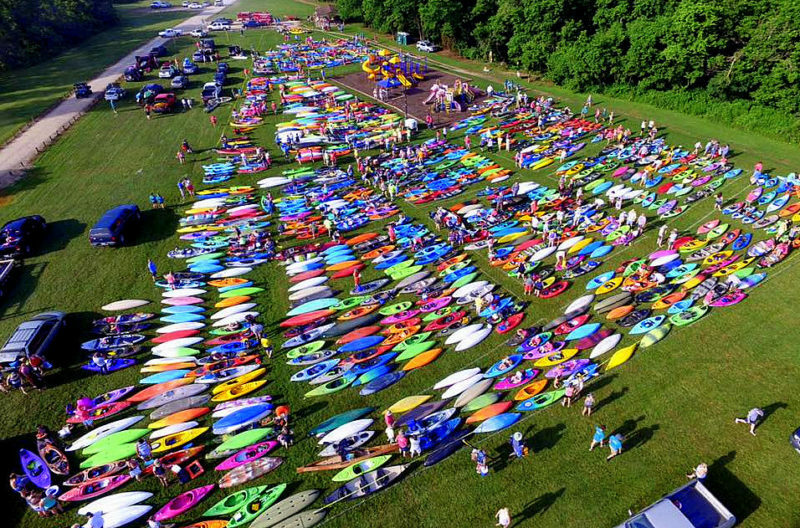 More than 1,600 paddlers joined in 2018, according to Bill Curry, president of Coal River Group, and more than 8,000 visitors attended Yakfest, a two-day celebration and exhibition that’s grown out of the tour. Curry said the event now brings more than a half million dollars in the region annually as soon a preparations begin in March. “The one-day Tour de Coal kayaking event coupled with the two-day YakFest—with its entertainment, food, craft beer, and vendors—creates income for all the local businesses—starting now,” Curry said. “The preparation of the Tour de Coal alone involves dozens of local business. We print and distribute over 1,600 shirts for the event, then YakFest has its own shirts. However, the improvement of the river remains the Tour de Coal’s chief mission, Curry said. “Of course, the real win is the fact that these events fund the continuing clean up of all our local rivers and streams,” Currey said. The Coal is now one of the cleanest rivers in West Virginia, though it sources in what had been one of the most industrialized coal-mining regions in the state, he said. Beginners and professionals alike, all are welcome to participate in the tour, which follows the lower 10 miles of the Coal River from its upper falls at Tornado to its mouth on the Kanawha River at Saint Albans. “The paddle event is for everyone,” Curry said. To register of find out more, visit Coal River Group.